The latest generations of LED lights for media production are now brighter, more lightweight, and more versatile than ever before, but it’s important to understand your requirements before selecting the lighting that’s right for your project. Here are our suggestions for evaluating and selecting LED lighting. Your choice of lighting depends on many variables: the natural light conditions of the location, the size and shape of the room, access to available power, your schedule, and the project itself. 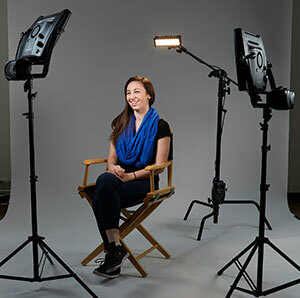 Unless you’re shooting in a highly controlled studio environment, you’ll have to work within the constraints of the location and that means having at hand a good assortment of both panel lights and single-source, Fresnel-style LED lights. Today’s high-quality Fresnel LEDs produce a single, directed, even-focused hard light, with soft edges that make it easy to blend the light with other Fresnels on the set for even coverage. Fresnels are essential when a harder light is needed, as it can throw illumination further. Plus, you can cut the beam with the LED’s “barn doors” to focus a light precisely and to create shadows wherever and whenever you want them. The best Fresnels are highly engineered and precisely tuned to deliver efficient beam emission, and they have soft and uniform optical characteristics by way of a high-quality, optical-grade thermoplastic lens design. While most traditional Fresnels are glass, this type of plastic design reduces overall weight, offers better performance than glass, and delivers a cost savings that can be shifted to higher-performing electronic and thermal management technologies. Panel lights consisting of an array of grouped LEDs provide a nice wash of light for close setups such as interviews. Panel LEDs typically come in two types: daylight, or tunable bi-color that allows the user to adjust a balance of daylight (5600K) or tungsten (3200K) color temperatures. The bi-color option makes it easier to tune color temperature for the best rendering of different skin tones, and accessories such as soft boxes (which are sometimes built into the light itself for greater convenience) can diffuse the light and create a soft, wraparound quality to flatter talent of any age. Consider a shooting location with daylight spilling in through a window and warm tungsten lighting inside the room with a bi-color light, you can dial in a specific color temperature that offers the most realistic rendition of skin tones. In other words, you can embrace the natural light and use it to your advantage. In the two-person interview setup below, the interviewer and subject are lit with a combination of panel lights for beautifully rendered skin tones and Fresnel ceiling- and boom-mounted lights to create separation between the subject and the background via a nice rim light. Portability, lighter weight, and significantly lower power consumption are other big advantages LED lights hold over traditional tungsten or HMI lighting, which means remote productions can apply studio-quality lighting at locations where it simply wasn’t possible or practical before. For shoots that require very fast setup, look for lights that offer maximum output in the smallest-possible and easiest-to-transport form factor. Powering the lights is another important consideration for remote productions. Most panel LEDs and even some Fresnels can now be run off battery power to reduce cabling and simplify on-location setup. The best lights offer an on-board power supply without the need for external ballast, or they can also be powered by external on-camera batteries. Any manufacturer of quality LED lighting should be able to provide you with an easy-to-use reference for determining how long your lighting will last when paired with different types of mobile power solutions. This mobility is a particular boon for field news and sports crews, who often have seconds to set up, do the shoot, and clear out. A sports reporter, for instance, might have 30 seconds to get in and do a stand-up injury report with a coach on a football sideline during a time-out. The reporter and camera operator can walk onto the field with a small LED panel, do the interview, and be done before the time-out is even over. Taking the bi-color option a step further, some of the highest-quality panel lights available today offer a combination of daylight, tungsten, and red-green-blue LEDs to deliver even more flexible and precise color adjustment. Until now, users of most 2x1 panels have achieved white light by mixing red, green, and blue, which can create undesirable color spikes. The new breed of panel eliminates this problem by giving users a daylight-to-tungsten light foundation and then enabling them to finely adjust color throughout the full, 360-degree color wheel. This means that users can match a broad range of ambient lighting conditions quickly and simply. One example might be shooting in an old warehouse with florescent lighting, where accurate white balancing could be easily achieved by adding or removing green. When evaluating these types of lights, it’s important to determine that the panel can precisely match existing tungsten lighting sources even when dimming the light down to zero, without color shift or flickering when dimmed. Looking ahead, we expect LED lighting to keep getting better and offer even greater versatility for media production. Innovations will continue to push the boundaries of color management and offer ever-brighter light in an increasingly lighter, cooler, and more compact package, making it ever easier to apply professional, studio-quality lighting in challenging, remote shooting locations.